In a quintessential example of precision medicine, an international team of more than 100 scientists from nine countries scanned the genes from more than 33,000 individuals searching for genetic variants responsible for age-related macular degeneration (AMD), the leading cause of vision loss among people age 50 or older. “The enormity and complexity of studying the genetics behind AMD required a large-scale computational analysis study of the disease that could only be performed by bringing together the world's leading researchers,” explained Jonathan Haines, Ph.D., chair of epidemiology and biostatistics at Case Western Reserve University (CWRU), whose team also helped guide the complex computational analysis of the data from those study participants with advanced AMD and those without AMD. As criteria for their analysis, investigators chose to study both common and rare genetic variations. These genetic variations affect physical traits such as eye color or susceptibility to specific diseases, and due to the millions of genetic variations present in the human genome, it took genetic, computational analysis from multiple centers to pinpoint the variations specific to AMD. After exhaustively sifting through the genetic data, the researchers discovered 52 genetic variants that were associated with AMD. These variants are located among 34 loci, 16 of which had not been previously associated with AMD. “If you think of these loci as points on our Google map in our search for the crime syndicate members or the genetic causes of AMD, in some cases they are as big as a zip code, but in other cases they pinpoint an area as narrowly defined as a few houses within a neighborhood subdivision,” Dr. Swaroop added. 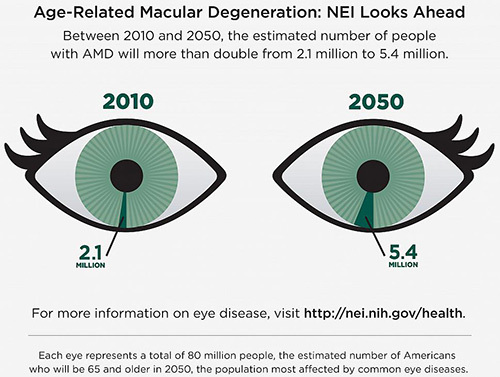 “The possible connection between AMD and these extracellular matrix genes may allow for predictive genetic tests and more effective therapies for people with this type of AMD,” Dr. Cooke Bailey remarked. Now that the scientists have this plethora of genetic information, they believe the next, most logical steps will be functional mechanistic studies to determine why and how key gene variations activate to cause AMD.